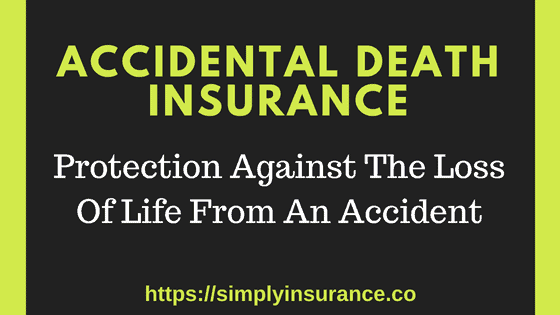 Get affordable accidental death quotes and apply online for coverage, all without an agent. ​click here to start your instant quote & get covered today! Get instant accidental death insurance quotes and approvals online. ​Your personal information isn't needed to get your accidental death insurance ​rates online. quote, there is no need to wait for an instant decision. ​So, What Is ​Accidental Death Insurance? against the loss of​ ​life caused by an accident. What Does An Accidental Death Plan Cover? An accidental death policy may help provide the financial protection for those you leave behind if something were to happen. Illness-related causes such as heart attacks or cancer are not covered, for a full list of causes that are Not covered, check out this great resource. How Does Accidental Insurance Work? ​The Insured - The person the insurance policy is being placed on. Beneficiary - The person the insurance policy's death benefit will pay out to. ​Along with being the most affordable type of life insurance product on the market, these products usually end at around the age of 60 to 65 so you probably want to purchase them early on. Like with any type of insurance, the younger you are when you purchase it the lower the monthly premiums will be. An accidental insurance policy is going to cover you for any type of death associated with an accident. There isn't any type of contestability period associated with these policies, if your death results from an accident, the Death benefit will be paid out to your Beneficiary. As you can see, the rates for death insurance are much more affordable than any type of life insurance mainly because it will only cover you if you die from an accident. How To Get The Best Accidental Death Insurance ? If you make sure your policy has at least 3 or all of those things then you will honestly get the best accidental death policy around. I have found that sometimes people get "Death and Dismemberment Insurance" confused with "Disability." An AD&D policy will protect your familys future in a different way. It also covers death from a car accident, most people assume that car insurers would cover this but their main focus is the actual vehicle, not the driver. I like to think of disability policies as paycheck insurance. If you are unable to work due to a disability, it basically will pay out to cover you during your down time. How much accidental death life insurance do you need? Most insurance companies allow you to purchase up to 30x your annual income, but we tend to recommend that you have at the least 10x your annual income in life insurance. So if you make $50,000 / year, a policy for $500,000 would be our suggestion. Is An Accidental Death Policy Worth It? ​Accidents are the fourth leading cause of death in the U.S.
​If you're between the ages of 25-34, you are almost 5 times more likely to pass away from an accident than from cancer. As a matter of fact, from the ages of 25-44, accidental death is your single greatest risk. We can gets you covered in minutes, not weeks, with plans starting at just $6/mo. Now, along with the fact that accidental coverage is super cheap and has no underwriting attached to it, I think its a great policy to have and it is 100% worth it. If you have been unable to get traditional life insurance due to your health or just want additional protection, then buying an accidental policy is a no-brainer. The first question you probably had was, is accidental death the same as life insurance? The biggest difference is that traditional life insurance comes with what is called an "All Cause Death Benefit" attached to it. This "All Cause" benefit means that the policy will pay out for death caused by an accident, chronic or critical illness, and terminal illness. With Traditional Insurance you are basically covered for any type of death, even suicide after the policy specific waiting period. Don't be alarmed, the policy is called an Accidental Death policy, so that is all that you really need it to do, cover you for an unexpected accidental death. If you need a policy to cover more than that, then you should check out our term life insurance quotes here. It is very easy to become confused when looking for accidental life insurance because there are cases where the policy will have dismemberment insurance attached to it. Be sure to get some solid benefit amounts since this policy will cover injuries or death. These policies will provide financial coverage if your death is the result of an accident. I am sure you can think of thousands of things that could happen that would be considered accidental. *The policy that we offer doesn't come with dismemberment coverage. The show 1,000 Ways To Die showed all sorts of deaths that result from an accident. QUOTE & GET COVERED TODAY!